This post is part of a series in which ladies on the road offer a review of their backpack. Today’s review is from Caroline Eubanks who is on her way home to the USA after living, working, and traveling in Australia. My name is Caroline Eubanks and I am a travel blogger over at Caroline in the City, freelance writer and part time bartender. I’ve been traveling on and off since I was 15 to Europe, Canada and Mexico, but after college I had few job prospects, so I decided to go on a working holiday to Australia. I’m currently traveling up the east coast, writing this post from the small town of 1770 in central Queensland. My backpack is a Kelty Arch 65L Women’s Pack in a lovely shade of purple. It retails for $115-140, but I got it on sale at the REI Outlet. I got my backpack for Christmas 2010, but I used it early in November for a job interview in London. Since then it has been to Los Angeles and all over Australia. I wanted a backpack made for women because obviously our bodies are made differently and how we carry weight differs. I knew I wanted a backpack under 75 L because I had borrowed one from a friend on a previous trip and I found it too big for my needs. In the end, I picked this backpack because it was on sale and because I had heard good things about Kelty. And because it was purple. The upsides to this pack are that it has top and front loading. There are side pockets and a top zipper section that can come off. 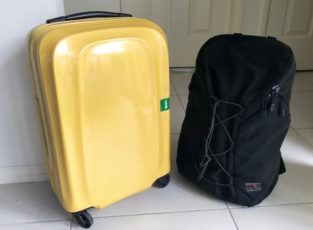 The downsides are that since it has an internal frame, it can be difficult to make things fit in your bag without pushing your whole weight into it. I got my backpack fitted at REI to ensure that all the straps were tight before I tossed a year’s worth of clothing into it. There is plenty of padding on the hip and shoulder straps, so that makes it more comfortable. All of this is negated if you pack too much, though. This bag is too big to carry on. I would recommend this backpack for a trip where you will be staying in one place for longer amounts of time. For long term travel, I would recommend something smaller. I also noticed that when I arrived in Australia, rips had already started to form on the front pocket. Thanks Caroline! Glad you enjoyed your travels in Australia and safe travels home! Learn more about Carline’s travels in Oz and what she has planned next at Caroline in the City, and connect with her on Twitter and Facebook. Thanks Caroline 🙂 Hope your Christmas at home is a great one!